Specially formulated for small breed dogs (up to 22 lbs) over 8 years. Highly palatable for the older dog as their sense of smell can begin to decline. Reduced phosphorous level* to help support kidney health. 5.8 Oz Mature Wet dog food Designed for the needs of small dogs up to 22 lb Highly palatable for the older dog as their sense of smell can begin to decline Reduced phosphorous level* to help support kidney health Can 100% Complete and Balanced Nutrition: Mature 8+ in gel Canine Health Nutrition is formulated to meet the nutritional levels established by the AAFCO Dog Food Nutrient Profiles for maintenance Calorie Content: Contains 957 kcal ME/kg (calculated). This 5.8 oz can contains 158 kilocalories of ME Ingredients: Water sufficient for processing, pork by-products, chicken, chicken liver, corn flour, rice flour, wheat gluten, powdered cellulose, dried plain beet pulp, vegetable oil, fish oil, carob bean gum, carrageenan, tricalcium phosphate, natural flavors, calcium carbonate, taurine, potassium chloride, citric acid, sodium silico aluminate, L-carnitine, vitamins [DL-alpha tocopherol acetate (source of vitamin E), niacin supplement, L-ascorbyl-2-polyphosphate (source of vitamin C), biotin, D-calcium pantothenate, thiamine mononitrate (vitamin B1), riboflavin supplement, pyridoxine hydrochloride (vitamin B6), vitamin B12 supplement, folic acid, vitamin D3 supplement], trace minerals (zinc oxide, ferrous sulfate, zinc proteinate, copper sulfate, manganous oxide, sodium selenite, calcium iodate), magnesium oxide, marigold extract (Tagetes erecta L.) General Analysis: Crude protein (% min.) - 7.5 Crude fat (% min.) - 3.0 Crude fiber (% max.) - 1.5 Moisture (% max.) - 79.0 Omega 6 (% min.) - 0.18. 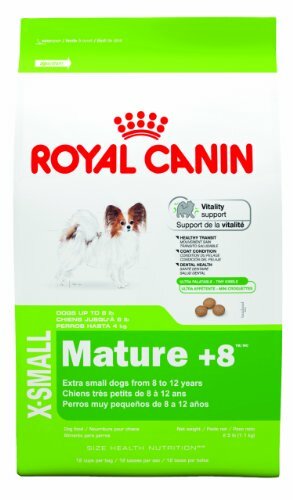 Royal Canin X-Small Breed Adult Dog Food is a complete feed for dogs - For very small breed dogs (weight up to 4 kg) Over 10 months old. 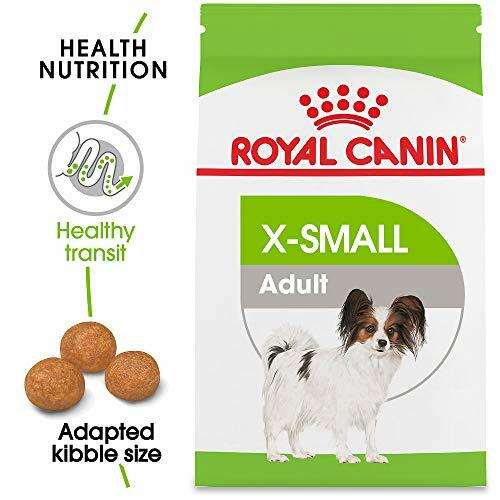 X-Small Size Health Nutrition is specially formulated to meet lifestage requirements aswell as the specific nutritional needs of these very little dogs. Small dogs can live twice as long as bigger ones, providing the right nutrition as they get older plays a huge role in a healthy life. Ageing actually takes place in two stages, starting at eight years old and speeding up from 12 years onwards. Approximate Dimensions (Product): 37 x 12 x 19cm. 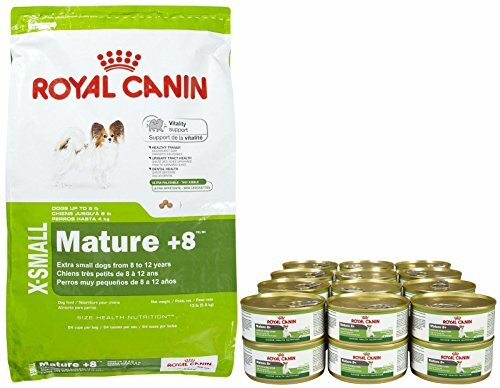 Royal Canin X-Small Puppy Dry Dog Food, 3 Lb. 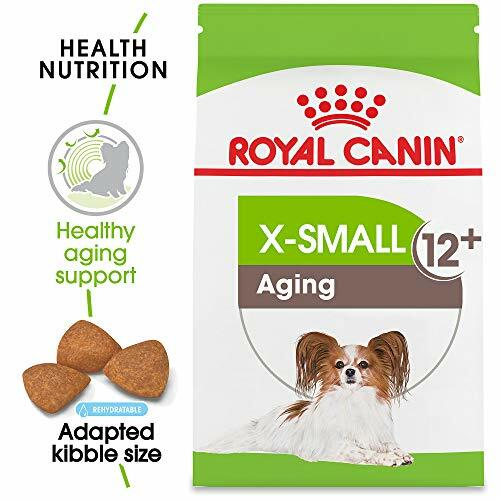 Royal Canin X-SMALL Mature +8 contains a content of nutrients and complex of antioxidants which help very small dogs maintain vitality and face the first signs of aging. This formula features highly digestible proteins and precise levels of various fibers to help regulate and ease intestinal transit. In addition, extra small kibble designed for their miniature jaw helps reduce the formation of tartar. This formula is highly palatable and satisfies the fussy appetites of extra-small dogs. Recommended for extra-small breed dogs (up to 8 pounds) from 8 to 12 years old. Size: 13 pounds. 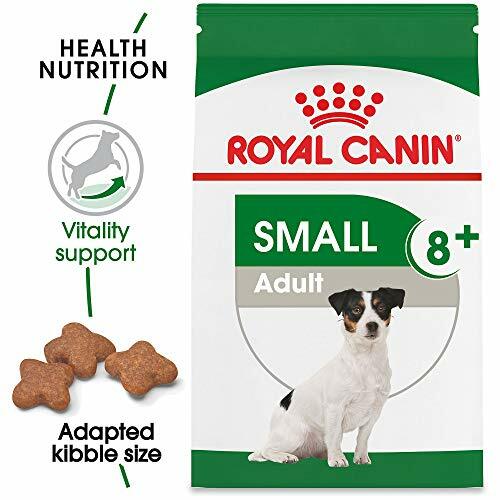 Bundle & Save when you buy these items together!Royal Canin X-Small Puppy - 15lbRoyal Canin X-SMALL Puppy is developed with highly digestible proteins for the best possible nutrient absorption and prebiotics to support digestive health. Extra-small dogs have unique physiological distinctions, such as jaw size, bone strength and digestive systems. This formula features an intensified energy content to support the high energy needs of very small puppies during their short, yet intense, growth period. This formula also supports the puppy's natural defenses with an antioxidant complex. Extra small kibble designed for their miniature jaw helps reduce the formation of tartar. This formula is highly palatable and satisfies the fussy appetites of extra-small dogs. 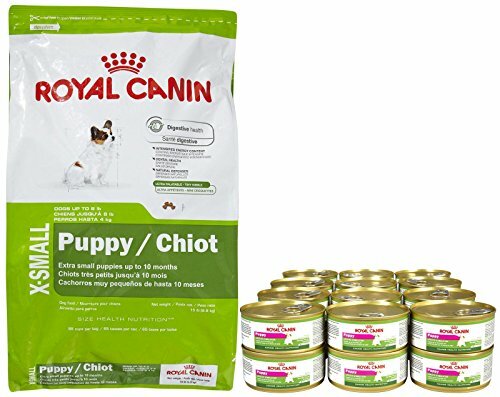 Recommended for extra-small breed puppies (adult weight up to 8 pounds) from 2 to 10 months old. Key benefits include: Digestive health Intensified energy content Dental health For small breed puppies 8 weeks to 10 months (up to 8 lbs. 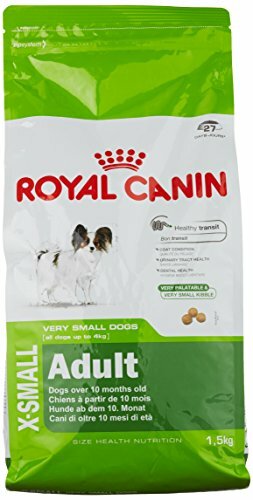 at adulthood)Royal Canin Puppy 24x5.8ozFor extra small and small puppies (up to 22 lbs as adults. 24-count of 5.8-ounce cans. 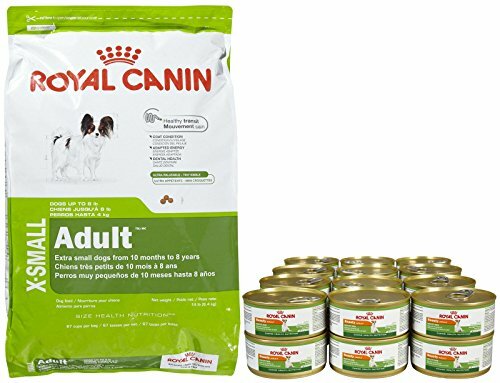 Bundle & Save when you buy these items together!Royal Canin X-Small Adult - 14lbRoyal Canin X-SMALL Adult features highly digestible proteins and precise levels of various fibers to help regulate and ease intestinal transit. Extra-small dogs have unique physiological distinctions, such as jaw size, bone strength and digestive systems. This formula also contains ideal levels of EPA and DHA to help support a beautiful coat and healthy skin. Extra small kibble designed for their miniature jaw helps reduce the formation of tartar. This formula is highly palatable and satisfies the fussy appetites of extra-small dogs. 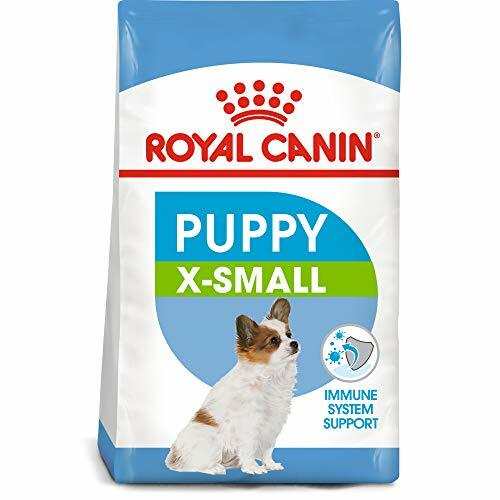 Recommended for extra-small breed dogs (up to 8 pounds) from 10 months to 8 years old.Royal Canin Adult Beauty 24x5.8ozFor extra small and small adult dogs (up to 22 lbs) with sensitive skin. 24-pack of 5.8-ounce cans. 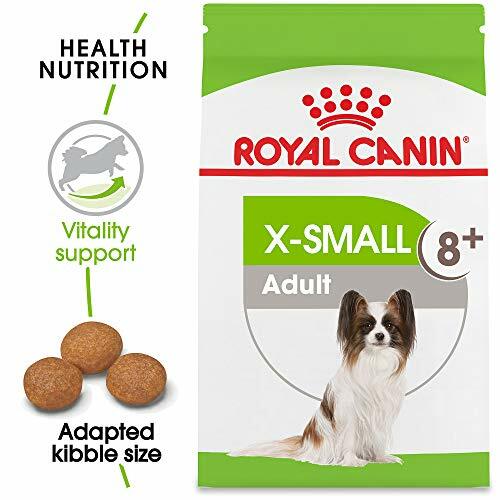 Bundle & Save when you buy these items together!Royal Canin X-Small Mature +8 - 13lbRoyal Canin X-SMALL Mature +8 contains a content of nutrients and complex of antioxidants which help very small dogs maintain vitality and face the first signs of aging. This formula features highly digestible proteins and precise levels of various fibers to help regulate and ease intestinal transit. In addition, extra small kibble designed for their miniature jaw helps reduce the formation of tartar. This formula is highly palatable and satisfies the fussy appetites of extra-small dogs. Recommended for extra-small breed dogs (up to 8 pounds) from 8 to 12 years old.Superior vitalityHealthy movementImproves skin and coat conditionFor small breed dogs 8 to 12 years of age ( up to 8 lbs. 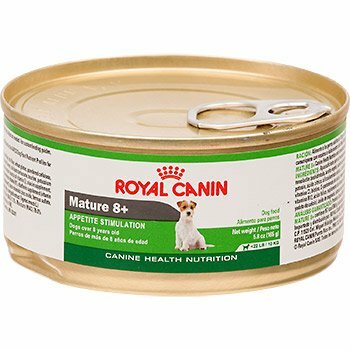 )Royal Canin Mature 24x5.8ozFor extra small and small senior dogs (up to 22 lbs) over 8 years old.